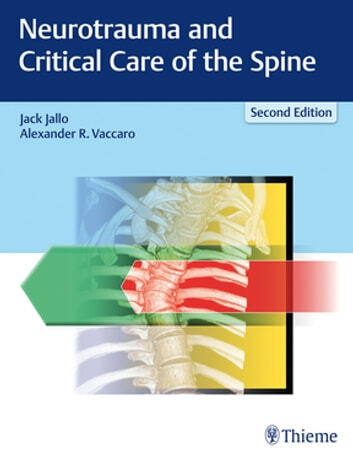 Neurotrauma and Critical Care of the Spine, 2nd edition, by a distinguished critical care neurosurgeon, Jack Jallo, and a renowned spine surgeon, Alexander Vaccaro, incorporates salient components of the highly praised first edition. The updated text reflects cutting-edge discussion on spine injury management in a neurocritical care setting. Contributions from top experts in neurosurgery, orthopaedic surgery, neurology, critical care, cardiac and pulmonary care, and trauma surgery infuse this book with a well-rounded perspective. From the pre-hospital to intensive care setting, this unique reference provides a comprehensive, yet concise approach to the treatment of acute spinal cord injury and management of patients with chronic SCI. Chapters new to this edition include neurological assessment of spinal injury, clearing the cervical spine, management of concurrent TBI and spinal injury, blood pressure and oxygen management, temperature management, fluids and osmotherapy, pharmacology, autonomic dysreflexia, infection after SCI, and emerging therapies. The definitive guide on the management of cervical, cervicothoracic, and thoracolumbar injuries, this is essential reading for neurosurgeons, orthopaedic surgeons, trauma and emergency specialists, and residents in these specialties. Paired with Neurotrauma and Critical Care of the Brain, 2nd edition, this dynamic duo is the most up-to-date neurocritical care reference available today.